West Side Detroit Polish American Historical Society Holds Tenth Annual Opłatek and Grand Gala Heritage Room Exhibit and Honors Polish Press on Sunday, December 27, 2015: St. Colette Catholic Church, Livonia. For the tenth Christmas season in a row, the Society held its Annual Opłatek during the week between Christmas and New Year’s. This year, the event was held on Sunday, December 27, at the Society’s headquarters, St. Colette Catholic Church in Livonia, from 2:00 to 5:00 p.m., and over 200 guests attended. Included in this year’s event was something special: a Grand Gala Heritage Room Exhibit that featured the completed mural by Hamtramck artist Dennis Orlowski. In early February 2015, Mr. Orlowski had been commissioned by the Society’s board of directors to paint a mural depicting life in Detroit’s west side Polonia. The event began with optional Mass in the church. Afterwards, Ms. Laurie A. Gomulka, Vice President & Executive Director/Secretary, welcomed all. She stated that 10 years ago something wonderful was happening on the west side of Detroit in our old Polish neighborhood. Several individuals were thinking about the same thing: Something needed to be done to form a group to preserve our heritage. At that time, the Dom Polski was owned by a family of Scottish descent and they were struggling, using the building to make production-line deli sandwiches in the basement and renting the main floor to various religious groups. A ballet company in Detroit whose leader had Polish connections had lost its home at Wayne State University and thought that the Dom Polski might make a good headquarters. Across the street and a few blocks down, Adam Lis, St. Hedwig’s historian and the grandson of founders of that parish, was working to create St. Hedwig’s Heritage Room. Laurie stated that she had the ultimate privilege of not only being Staś’s caregiver for the five and-a-half years that he remained with us, but also of reliving his remarkable life with him since he had been her father’s colleague as a young man. It was a life changing experience that altered the course of her own life and gave her a new purpose-a mission. Out of that friendship the West Side Detroit Polish American Historical Society was born. Staś became the Society’s founding President at 82 years of age-a year before his death. He was a testament to the value of life and to the fulfillment of dreams. The ballet company moved on and the Society’s dreams for the Dom Polski were somewhat fulfilled. The Society was formed in 2005 and incorporated in 2006 as a 501(c)(3) non-profit with its home and headquarters in St. Hedwig parish, as if destined to be there. The Society was able to get the Dom Polski listed in the National Register of Historic Places-a major achievement. Adam Lis became the Society’s president for a term and then Fr. Gary took over, which has been a blessing. Under his leadership the organization has experienced tremendous growth, and the board of directors is extremely grateful to him and to the staff of St. Colette Parish. Laurie stated that because of Fr. Gary, we have a new home at St. Colette with a state-of-the-art Heritage Room. We purchased a table and chairs for our board meetings in the Heritage Room and a computer hutch. This past year, we were able to enhance our Heritage Room because of the gifts of the donors to our “Faces of West Side Polonia” mural project and those of our Corporate and Patron Sponsors. She stated that we are overwhelmed by their generosity, and on behalf of the board she thanked each of them from the bottom of our hearts. She said that none of what we have accomplished would have been possible without them. All of their names were printed in today’s program and listed in the Heritage Room and also have appeared in a newsletter or will appear in an upcoming newsletter. Laurie acknowledged many other individuals, including Lorraine Kasper, the Society’s archivist, and her team of hard-working volunteers: Barb and Bev Cuzick, Marlene Kriscovich, and Elizabeth Ronewicz. Laurie stated that because of our donors, we were able to have our mural completed and to re-cover the old bulletin boards and chalk board directly below the mural, which were real eyesores and which detracted from the beauty of the mural. We have been able to purchase display cases and to hire a graphic artist to create a map of our official territory. A prototype of the map is on the wall in the Heritage Room and we will have the final map printed after the New Year. She acknowledged and thanked member Lawrence A. Choraszewski, who built the glass display cases for the Heritage Room and who performed the labor to re-cover the old bulletin boards and the chalk board. She recognized and thanked our muralist, Mr. Dennis Orlowski, stating that he is a great artist and a great human being. It has been a privilege and an honor to work with him, to talk with him, to get to know him and learn from him, and to have our mural created by him. She acknowledged and thanked Society member, artist and sculptor Evelyn Bachorski-Bowman, who volunteered hours of her time guiding us with a professional vision for the Heritage Room. Without her direction the room would not have turned out as beautiful and cohesive as it did. Laurie stated that we also plan to have an accompanying book published as part of our map project as a fundraising initiative for the Society that will list hundreds of sites and businesses in our west side Polonia. The board is seeking members’ input. Laurie stated that this is something that we don’t have on the west side. There have been many books published about Hamtramck and Detroit, but none specific to Detroit’s west side Polonia. The board of directors is grateful for the Society members’ input on this groundbreaking initiative. There are many items that still need to be purchased, Laurie went on to say, but the board of directors continues to work toward its goals with hope and faith. Finally, she thanked all who have supported the Society throughout the past 10 years by their membership, by sending in stories and photos, and especially by attending our events. She stated that those who have supported the organization in these ways are the backbone of the Society. It has become customary and a tradition at this event each year for the Society to recognize and honor an organization or group that has served Detroit’s west side Polonia throughout the years. 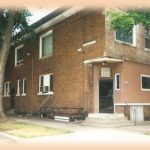 This year, the Society recognized and honored two local newspapers, Polish Times/Czas Polski, and Polish Weekly/Tygodnik Polski, as well as the former West Side Courier, which was located at 5757 Michigan Avenue and which served our Polonia for approximately 40 years beginning in approximately 1930. Editors of both Polish newspapers (Alicja Karlic of Polish Weekly and Sebastian Sczcepanski of Polish Times) were present to receive special certificates recognizing their important roles in Polonia. The certificates were presented by the Society’s President, Rev. Gary Michalik. Laurie stated that both newspapers have consistently promoted the Society and its events. In addition, a framed certificate honoring the former West Side Courier and including a brief history of that newspaper was prepared and is being preserved in the Heritage Room as part of the Society’s archives. The event continued with a musical program of Polish Christmas carols (kolędy) by one of the best Polish-American choirs, Detroit’s renowned Filarets. Under the direction of Mr. Piotr Szawieła, the mixed choir presented a recital of beloved Polish Christmas songs and also led everyone in a sing-along of additional selections. Fr. Gary concluded the program by thanking everyone for coming and invited all to the Activities Center for the Grand Gala Reception. There, after Fr. Gary recited a blessing, all joined in the traditional sharing of opłatki wafers. A light reception of hors d’oeuvres, Christmas cookies, coffee, and tea followed. The Heritage Room was open, which featured an exhibit of many of the Society’s archives arranged in a display to complement the theme of the mural. Dennis Orlowski was present to greet guests and to answer questions. Many individuals joined the Society as new members as a result of this event, and the board of directors is grateful for 10 years of blessings. We wish all a very Blessed and Merry Christmas and a Happy, Healthy, and Prosperous New Year! Wesołych Świąt i Szczęśliwego Nowego Roku!